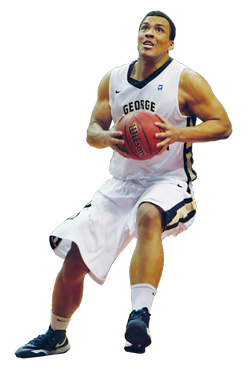 Against St. Bonaventure Jan. 9, the Colonials took the court with a new starting lineup. That, in and of itself, was somewhat unremarkable. But that day, the Colonials’ starting five featured four freshmen – and the team blew out the defending A-10 champions, defeating them 78-59. Since then, the Colonials have compiled a 4-2 record while starting four true freshmen. While some may have seen the roster move as a gamble, head coach Mike Lonergan said he wasn’t nervous about sending four freshmen onto the court. After all, they come with built-in chemistry. The four freshmen starters, Kethan Savage and Patricio Garino, Joe McDonald and Kevin Larsen, are roommates. Quarterbacking the “freshman four” is Joe McDonald, the point guard who joined the Colonials and immediately began to shoulder the burden of running their offense. He struggled under the pressure a bit at the beginning of the season, fouling out of games and looking shaky at times. But since the starting five revamp, McDonald’s ease on the court has become apparent. 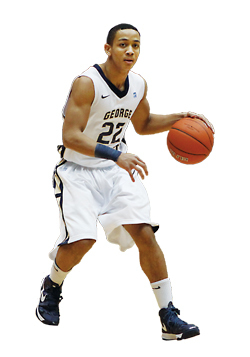 Along with senior point guard Bryan Bynes, the two have tallied 44 assists and just 14 turnovers over A-10 play. And McDonald ranks in the top 15 in the league in assist-to-turnover ration. Adding Savage to the starting rotation, McDonald said, was another key component to increasing his comfort level. Their time together on the court far surpasses their time in Colonials uniforms. Both local recruits, they competed against each other in high school and would eventually play on the same AAU team. The familiarity, both with McDonald and the other freshmen, is invaluable for Savage, who’s averaged 47.6 percent shooting since joining the starting lineup. Rounding out the rest of the freshman starters are two international recruits: Garino and Kevin Larsen, both forwards. 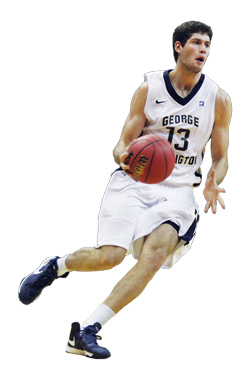 Garino’s rapidly making a name for himself as both GW’s best perimeter defender and streak scorer. He’s the blur on the court that weaves in and out of traffic both to take the ball to the net and to halt its path at the other end of the court. He’s averaging 50.9 percent shooting and has 15 steals over A-10 play. Garino’s become so adept at throwing together a steal, fast break and lay-in that fans joke he should trademark the move. Often setting up McDonald, Savage and Garino to score is Larsen, who patrols the paint along with the fifth starter, senior forward Isaiah Armwood. Even when Larsen struggles to score in a game, as he did against Charlotte, he’s conscious enough to create opportunities – dishing out three assists against the 49ers. Learning to supplement his play comes partly from the chemistry he attributes to his fellow freshmen, but also from Armwood. Perhaps the greatest strength of the Colonials’ young starting lineup is the ripple effect it has on the rest of the team. 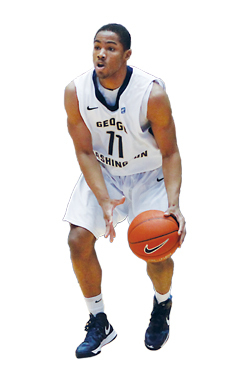 GW’s bench has exploded since A-10 competition started, outscoring opponents 181-67. Much of the bench is still averaging starter’s minutes, Lonergan pointed out. They just come with more production. All four freshmen seemed to have resisted the inflated egos that could come with stepping into a starting role so early in their collegiate careers. It’s about the team, they insist, about winning, and about the chemistry they’ve been able to build. The Hatchet incorrectly reported that the men’s basketball team was the only team in the nation to start four true freshmen. That was no longer the case starting Jan. 26, 2013, when the Army Black Knights of the U.S. Military Academy started five plebes. This article appeared in the January 31, 2013 issue of the Hatchet.